Have you ever wanted to stay at one of those impressive mansions scattered through the English countryside? You can get that chance at Cliveden House during your next trip to the UK. Set on 375 acres above the Thames River, the estate has manicured themed gardens and endless forest trails, so beautiful that they attract a half million visitors a year. The estate is owned by the National Trust and is open to the public who can walk the grounds, come for tea in the Great Hall, or enjoy an elaborate dinner in the French Dining Room. 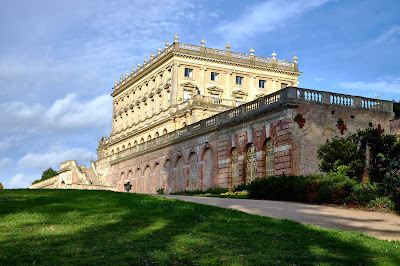 Cliveden has been home to British nobility, including an earl, three countesses, two dukes, and a Prince of Wales. It was purchased by American millionaires, William Waldorf Astor and Nancy Astor, in 1893. In an interesting historical twist, Lady Astor became the first woman member of the House of Lords, even though she was American. 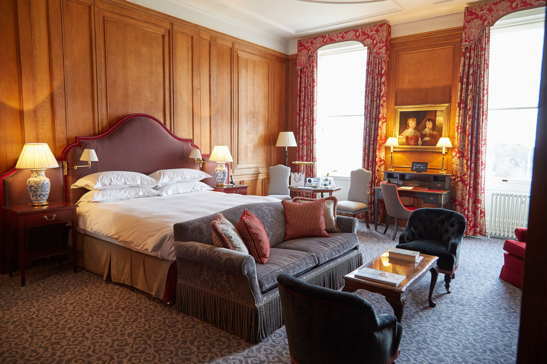 Now a luxury hotel, you can spend a night or two at Cliveden. Just a half hour from Heathrow, even during rush hour, this is an ideal place to spend your last night before flying home. A notable recent guest was Meghan Markle who stayed here the night before her wedding to Prince Harry. Pictured below is the Buckingham Suite, the room at which I have stayed during both of my visits. Virtuoso guests receive full daily English Breakfast for two and a $100 hotel credit which you can apply towards dinner or a treatment at the spa. copyright (c) 2018 by Ourisman Travel LLC. All rights reserved. We provide Virtuoso and other Preferred Partner amenities as an affiliate of Brownell, a Virtuoso® Member. If you have comments on this column, or questions about booking travel, email me or visit my website.